AQUA STAR, turns almost in its own length. It keeps hold of depth due to the additional shunting engine. Observation glass is flat, and doesn't mist thanks to airflow. Excellent visibility, easy and comfortable to breathe, easy to manage. Stock air for 40 minutes. Speed 7 km / h. Diving depth up to 12 m. Battery is designed for 2.5 hours of work. While diving ears are slightly layed like while flying a plane. It is enough to make a jolt or close your nose with the hand and blow the nose .. 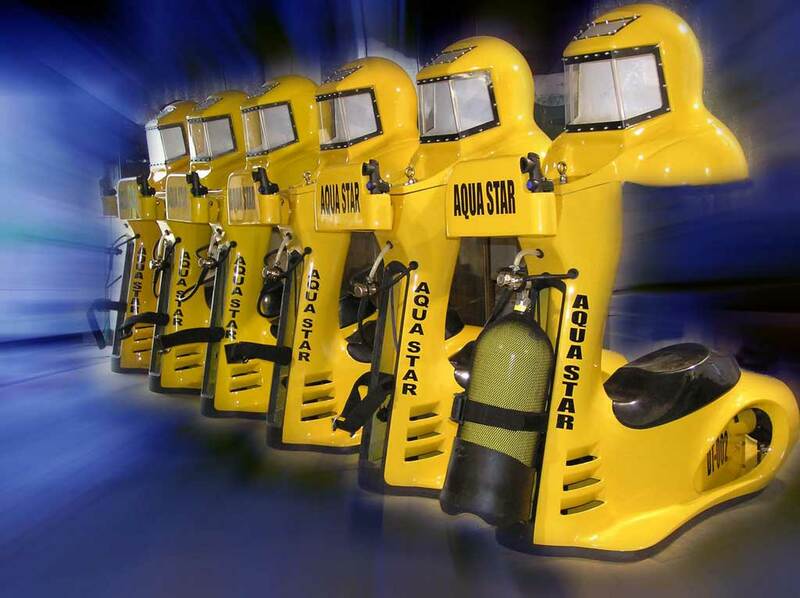 The "AQUA STAR 2" brand is absolutely new submersible, not similar to its predecessors. 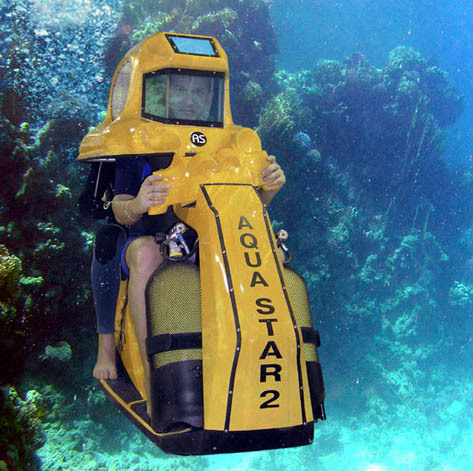 The idea of creating of easy to operate and reliable travel underwater vehicles was underlained in its elaboration. Every year, lots and lots of people from all over the world visit the coastal resorts, and only 18% are able to learn diving and get a chance to admire the underwater world. The "AQUA STAR 2" rases these bounds. Now 90% of the public can dive under the water at 12 meters freely. Together with a specially trained instructor pilot you will be able to enjoy the world of silence. You do not have to learn to control apparatus. 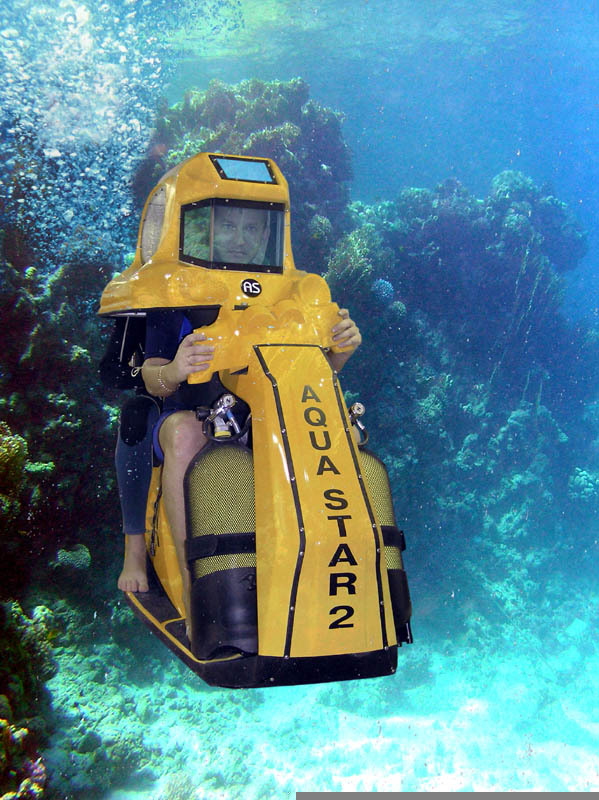 Just a few safety rules, and if health allows , you are ready to become a passenger of yhe "AQUA STAR 2". In the course of travel you do not need to get distracted with management apparatus, a pilot will manage it for you , but you can safely take pictures or capture on the video. Large side glasses provide excellent visibility. Weight of empty apparatus 40 kg . In the loading condition 80 kg. In contrast to the single-place model vehicle accelerates steady and is easily kept at a given depth. The device can be lowered to 20 meters, but the basic operating depth of 7-12 m.
Air reserve for 1h 10min. Two oxygen cylinders of 12 liters. At the helm are instruments (pressure gauge and depth gauge), and two control buttons. Forward button (from the right), and a button to hold at a given depth (from the left). The great advantage of this apparatus is that the pilot and passenger can communicate with each other, it is very important at the moment of submergence. The big problem when you submerge is blowing ears. The pilot can adjust the depth and sinking speed, thus enabling passengers to blow ears and adapt. Ballast bowl in the apparatus is of a larger volume that provides a fast rise during an urgent surfacing. Also within the airspace it is fair space to place two mini-scuba Spare Air. Tests showed that the passenger is experiencing less stress, being close to the pilot-instructor. If a person wants to study to control apparatus independently, it is easier to assist in training, while the instructor sits at the rear of the passenger, and adjusts his/her actions.